Aberystwyth Town Library LibraryThe Ceredigion Library and County Archive facility opened at the new Canolfan Alun R Edwards centre in April 2012. The new centre provides located in the old Aberystwyth Town Hall, includes the Aberystwyth Library, Local History collection and the Archives all under one roof. The centre bears the name of Alun R. Edwards (1920-1986) who made a huge contribution in the book world, and promoted reading and Welsh culture in general. He was raised in Llanio, near Tregaron, and worked at the National Library as a young man. In 1950 he became County Librarian for Cardiganshire and during his tenure he oversaw the expansion of the mobile library service, and the service set to work in organising cultural programmes such as reading groups and book quizzes. The County Archives contain local government and community council documentation, in addition to a variety of collections: Hafod Uchtryd Estate and Friends of Yr Hafod, a Beekeeping Collection (Welsh Plant Breeding Station), documentation on local railways, epitaphs from county graveyards, court, coroner and police records; maps, early architectural sketches and so on. 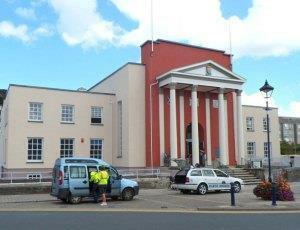 The Ceredigion Library and County Archive facility opened at the new Canolfan Alun R Edwards centre in April 2012. The new centre provides located in the old Aberystwyth Town Hall, includes the Aberystwyth Library, Local History collection and the Archives all under one roof. Aberystwyth Library offering a wide range of books, talking books, DVDs, music CDs for loan, access to online resources including eBooks, local and family history collections, computers and free WiFi.